A successful stay is characterised by an excellent wining and dining experience. At Tyrstrup Kro, we serve everything from small, simple dishes to large gourmet dinners. What each and every meal has in common is the fact that they are based on produce fresh enough to satisfy even the pickiest of eaters. 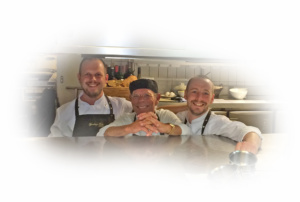 Our talented chefs and their outstanding manager ensure that every meal is prepared to perfection. No good meal is complete without an excellently paired beverage. Aside from beer and water, we offer an extensive selection of wine from our cellar. We offer quality wine to suit every budget.